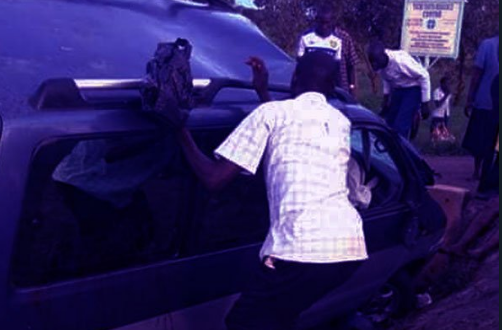 OMORO – Seven people were Wednesday, August 29 evening killed in an accident at Tochi swamp in Palenga village in Omoro district on Gulu-Kampala road. A Police report revealed that the accident occurred at 6:40 pm when a vehicle UBD 227C Noah being driven by a yet-to-be-identified person rammed into two motorcycles, UDK 515S which was being ridden by Anthony Ocitti, a director of Omoro Central High School, and the other motorcycle registration number UEF 224A ridden by one, David Nyeko, 48, a boda-boda rider. The deceased have been identified as Jessica Labol, 46, Nyeko David, 48, Christine Lanyero and her twin babies; Blessing Acen and Jovin Opiyo. The other victims include Jane Nakatude the director of One way Primary School in Bobi Subcounty, and Pretty Agenorwot, 11. Jimmy Patrick Okema, the police spokesman for Asaw river region, confirmed the incident to have occurred when the two motorcycle riders joined the main road without checking the road and landed into the speeding vehicle which was heading to Lira district. Okema said the deceased were taken to Gulu regional referral hospital mortuary pending postmortem while the victims are receiving treatment at both Gulu Regional Referral Hospital (GRRH) with others taken to St Mary’s Hospital Lacor. He identified the victims at GRRH as Gloria Akwero, 22, pedestrian, Scovia Adong 27, Lucy Asio,28 and Agnes Asio,23 a resident of Lira district. He said the driver unidentified driver ran away after the incident and police is still tracing his whereabouts. meanwhile, okema said victims at Lacor hospital are yet to be identified. Both the vehicle and the two motorcycles have been parked at Bobi Police post in Omoro district. Two weeks ago Makome bus knocked dead a boda-boda rider at Bobi trading centre and overturned injuring about 20 students of Kitgum Technical college who were travelling for a sports game at Bobi polytechnic school. The incident happened a few kilometres away from the Wednesday’s one.